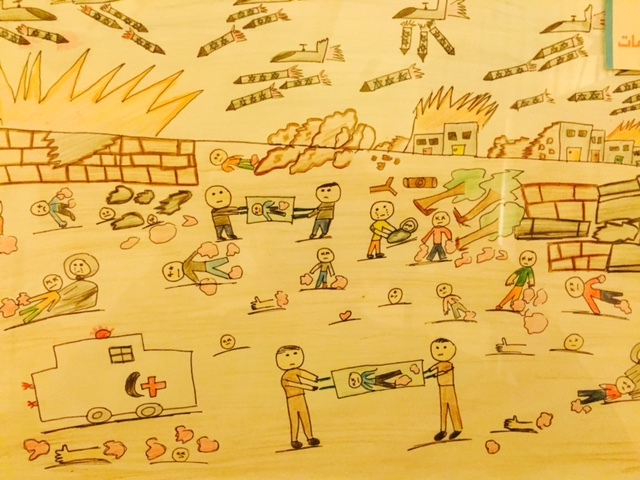 On this page, you’ll find current and past campaigns promoted by the Gaza Community Mental Health Program and partners within the international community. Beginning in the early 1990s Israel imposed restrictions on who could enter and leave the Gaza Strip and sometimes closed it completely for weeks at a time. The restrictions have affected the economy and prevented patients from obtaining medical care and students from reaching their universities. The Israeli closure was significantly tightened after Hamas won the January 2006 legislative election that former US president Jimmy Carter called transparent and fair. It was transformed into a chokehold in June 2007 after a clash with a CIA-backed Fatah militia led to a total Hamas takeover of the territory. Initially under the harsh economic siege initiated by Israel only 12 basic items were permitted to enter the Gaza Strip – and just enough of them to keep people alive. Electricity and fuel were severely rationed, and cement, soap, many medical supplies, potable water and raw materials were kept out all together as Israel made Hamas-ruled Gaza a laboratory for trying out its new weapons systems and finding the breaking point of human beings. The world is witnessing a terrible human rights crime in Gaza, where a million and a half human beings are being imprisoned with almost no access to the outside world. An entire population is being brutally punished. Still, the siege went on, preparing Gazans for the “shock and awe” of Israel’s military might over the next six years: what it called Operation Cast Lead (December 2008 to January 2009); Operation Pillar of Defense (November 2012) and the summer of 2014 51-day onslaught named Operation Protective Edge. These offensives have killed thousands of people (more than 800 of them children) and wreaked massive destruction on homes, schools, hospitals, municipal buildings, mosques, the industrial area, agricultural lands, and the vital infrastructure for water, sewage and electricity. And after each aggression the Israeli-imposed closure remained in place, slowing down or barring altogether the import of most essential building materials, and forcing tens of thousands of people to live in the rubble of their homes, Much of the infrastructure in still ruins. The Gaza Community Mental Health Program launched an international campaign to lift the blockade in the fall of 2007. They organized a “Siege and Mental Health” conference, with internationals and West Bankers connected by video link when they failed to get access to the Gaza Strip. They called for International Days of Action and encouraged relief convoys and solidarity flotillas to attempt to break the siege carrying vital supplies. Since then, there have been numerous attempts to reach Gaza by land and by sea. In 2008 Israel allowed one boat to reach the Gaza Strip, but subsequent attempts were violently intercepted by the Israeli Navy. In May 2010, 10 activists were killed when Israeli commandos raided the Turkish ship the Mavi Marmara in international waters. Participants included an 85-year-old American Holocaust survivor, Hedy Epstein, the acclaimed writer Alice Walker, civil rights movement veterans, Ronnie Kasrils, a leader of the South African liberation struggle and a substantial delegation from the Congress of South African Trade Unions (COSATU). In April 2016 the GCMHP held its 6th International Conference on “Mental Health and Human Rights in Palestine.” A German NGO managed to secure Israeli permits for the entry of just over a dozen Europeans and America participants, an accomplishment that was presented by conference organizers as a harbinger of the day when Gaza’s intense isolation would be at a end. Conference presentations took stock of the damage that has been done to individual psyches and the collective social fabric by three military onslaughts in six years, as well as the psychological stress imposed by the lack of freedom of movement, mass unemployment and current political realities. 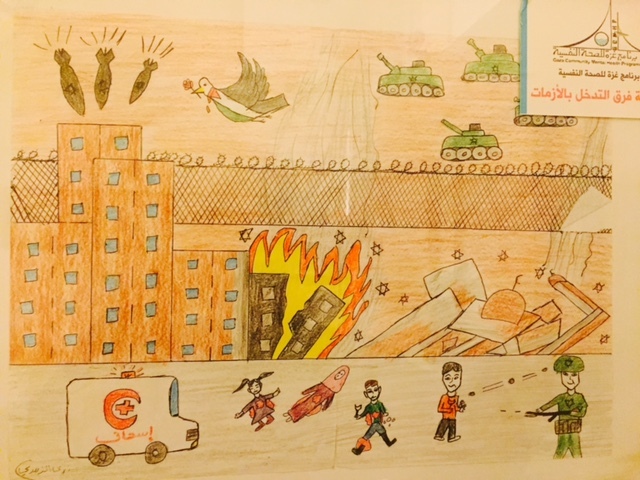 The world inside Gaza was grimly portrayed in an exhibit of children’s drawings of the machinery of death, compiled by the GCMHP. Some of those pictures accompany this posting. Open or download the poster. We, the undersigned civil society organizations in Jerusalem, condemn the Israeli military aggression in the form of genocide and ethnic cleansing of Palestinians in the Gaza Strip. We appeal to you, the International Committee of the Red Cross, as guardians of the Geneva Conventions, that states mainly, the protection of civilians in times of occupation. The failure to protect, as is your responsibility, will undoubtedly further exacerbate the beginning of a Holocaust, as publicly stated by the Israeli war criminal, Matan Vilnai, on February 29, 2008. Since Wednesday, February 27, 2008, over 100 Palestinians, of which one third were children, have been brutally murdered by the Israeli occupation military forces. The atrocities continue as we write this statement to you, and the world community watches in silence. In light of the continuing massacres in Gaza Strip as well as the West Bank, we demand the High Contracting Parties, in particular Member States of the European Union, to fulfill their legal obligations under common Article 1 of the Geneva Conventions and Article 146 of the Fourth Geneva Convention. We call upon the Member States and the International Committee of the Red Cross to take the necessary measures to prosecute those responsible for grave breaches of the Geneva Conventions and to ensure that Israel, as an occupier, abide by the international humanitarian law and its legal obligations. To prosecute the Israeli military Generals who are responsible for the massacres in the Gaza Strip as criminals of war. Our sit-in will continue until our demands are met. On Saturday, January 26, from NOON to 1 PM in Harvard Square there will be a demonstration in support of the International Campaign to Break the Siege of Gaza. On that date, Israeli peace groups will attempt to enter the Gaza Strip with a convoy of essential supplies and medicines. Gaza no longer has sufficient fuel to keep its power station running. Hospitals and homes are dark and cold, remaining food stocks are being spoiled, the water and sewage infrastructure is breaking down. We American taxpayers who make this collective punishment possible must raise our voices. Please join us if you can – the group will gather on the sidewalk in front of Au Bon Pain. One hour before it’s dark. The Israeli military establishment decided to stop power supply and fuel to Gaza. Since Thursday, food and humanitarian aid are not allowed in. Very soon life will come to a standstill. Water will not be pumped for even a drink. My step son is on ventilator for asthma every night. What will happen to him when our generator is not running any more? What will happen to hospitals, vaccines and blood banks? What will happen to patients on dialysis machines, and to babies in incubators? As early as January 3, Israel was alerted to the severe shortage in industrial diesel — but refused to relent from its punitive measures. Monday, January 21, 2008: Human rights groups submitted today an urgent request demanding that the Supreme Court issue an interim injunction preventing Israel’s military from continuing to restrict the supply of industrial diesel to the Gaza Strip. The request was submitted after Gaza’s power plant was forced to completely stop the production of electricity, on Sunday, January 20, 2008, at 20:00, due to the shortage in industrial diesel. Currently, the Gaza Strip is suffering a 43% deficit in electricity. There is only 120 mega-watts supplied by Israel and 17 megawatts supplied by Egypt to Rafah. During the winter, the demand for electricity in the Gaza Strip is approximately 240 mega-watts, or more, depending on the weather. The Gaza Electricity Distribution Company (GEDCO) is unable to provide the electricity needed to operate hospitals, water pum! ps and schools. Hospitals in Gaza have declared a state of emergency and have shut down operating rooms, the water system is struggling to operate, and power outages are scheduled for 16 hours a day or more. This is an intentional crisis, well-planned in advance. For months, we have warned that Israel is not allowing Gaza residents to purchase the amount of industrial diesel they need in order to produce electricity. At the beginning of January, we warned that the reserves were depleted. The arithmetic is simple: if Israel prevents the power plant from obtaining the amount of diesel it requires, the plant cannot operate. This is an intentional decision designed to harm civilians, in flagrant violation of international law. On January 3, 10 human rights groups submitted an urgent request to Israel’s Supreme Court asking for an injunction against the industrial diesel cuts. The groups warned that fuel reserves had been exhausted in Gaza’s power station, which serves Gaza City and the Middle area, home to 800,000 residents. The groups included an affidavit from utility officials in Gaza warning that Gaza’s power plant would have to reduce production if the restrictions on its ability to obtain industrial diesel were not lifted. Israel controls Gaza’s borders and does not permit supply except via Israeli-controlled crossings. On January 5, Gaza’s power plant reduced electricity production by 30% because of the shortage in usable industrial diesel. Access to drinking water was interrupted, and the functioning of hospitals was compromised. On January 10, Israel announced that it would temporarily permit Gaza residents to purchase industrial diesel at the level they ordered prior the October 28, 2007 cut (2.2 million liters per week). On January 11, the human rights groups warned that 2.2 million liters/week is insufficient, because in the winter months, the power plant needs more fuel to run the turbines. The groups told the court that in order to operate properly, the power plant needs 3.5 million liters industrial diesel per week and approximately 2 million liters to replenish its exhausted reserves. On January 13, the court rejected the petitioner’s request for an injunction against the industrial diesel cuts, and on January 16, the court rejected their request for reconsideration. On January 16, the human rights groups warned the State Attorney’s office that the amount of industrial diesel supplied to Gaza is insufficient and that the power plant risks shutting down one of its two turbines, for lack of fuel. On the morning of January 20, the human rights groups warned that one turbine had already shut down because of the shortage in industrial diesel, and that the second one would stop working, too, if the power plant was not permitted to receive additional industrial diesel immediately. On the evening of January 20, at 8 pm, Gaza’s power plant ceased production. Despite Israel’s commitment to allow Gaza residents to receive 2.2 million liters industrial diesel per week (insufficient in itself), the week of Jan. 13-Jan. 20, Israel permitted Gaza residents to receive only 1.975 million liters, and it has not allowed any diesel to be supplied January 20 and 21. Gaza’s power plant needs 3.5 million liters industrial diesel per week plus 2 million liters reserves. Read affidavits from Gaza utility officials here and here. See photos of Gaza in the dark. On Saturday, January 26, relief convoys will depart from Haifa, Tel Aviv, Jerusalem and Beer Sheva, bearing signs ‘GAZA: LIFT THE BLOCKADE!’ Converging at Yad Mordechai at 12 noon, the rally will be at Erez Checkpoint at 13.00. On the other side will be hundreds of Gazans, organised by The Palestinian International Campaign to End the Siege on Gaza (www.end-gaza-siege.ps), including psychiatrist and human rights activist, Dr. Eyad Sarraj. The convoy will carry vital supplies, with an especial focus on water filters, since the water of Gaza is an undrinkable cocktail of brine, sewage, pesticides and oil, with levels of nitrates ten times higher than those set by the WHO, and coliform eight times higher: denial of filters to Gazans is an unacceptable violation of basic humanitarian standards. We will insist that the military authorities allow the goods entry into Gaza, are prepared for prolonged stay near Erez, and a public/judicial campaign. January 26, 2008 is an International Day of Action, when worldwide peace groups will hold protest actions against the danger of war in the Middle East. Participating: Gush Shalom, Coalition of Women for Peace, New Profile, Combatants for Peace, Israeli Committee Against House Demolitions, Physicians for Human Rights (Israel), Hadash, Balad, Adalah, Tarabut-Hithabrut, Bat Shalom, Bat Tzafon, Anarchists Against the Wall, Follow-up Committee of the Arab Population in Israel, Alternative Information Center, Psychoactive, ActiveStills and Student Coalition ‘ Tel Aviv Univ. Background: Despite unilateral evacuation of 7,000 settlers, the Gaza Strip remains Occupied Territory. Israel continues to control its airspace, territorial waters, population registry, tax system, supply of goods, freedom of movement and access to healthcare. Last week, Israel strongly reprimanded Egypt for having dared to let a single group of Palestinians go in and out of the Strip without subjection to Israeli security checks. Moreover, recently Israel has re-established military control over more than a quarter of the Strip’s total territory as ‘border security zones’. Israelis are led to believe ‘We gave back Gaza’ ‘ but this is simply not true. We sympathize with Sderot’s residents, exposed to traumatising years-long Qassam rockets, but siege and collective punishment are no answer: although 1.5 million men, women and children are denied basic necessities, driven to the edge of starvation, the Qassam attacks continue. Nor has the constant military offensive (1,000 Palestinians were killed in 2007, including many civilians), stopped the rockets. Whilst Sderot suffers, few ask why several Palestinian ceasefire offers have been rejected out of hand by the Israeli government. We’ll go to the Gaza border, in co-operation with Palestinian partners inside Gaza, to show there’s a peaceful alternative to siege and rocketfire. Please bring a food item to deliver to the consulate. We are going to present cartons of food and medical aid to the Israeli consul’s office (Park Plaza Hotel, noon Thursday 24 January) and request that it be taken to Gaza, and that the Israeli government let the Gaza Relief Convoy through the Erez Checkpoint on 26 January. In protest of the Israeli continuous siege on Gaza, Israeli peace groups led by Gush Shalom and in coordination with End the Siege campaign, initiated a Relief Convoy to Gaza on Saturday, January 26, 2008, on both sides of the Karni crossing in Gaza, with Israeli, Palestinian and International participation. We urge you all to support this action and to take an active part in making it a success. This initiative will certainly create a momentum which we must employ by declaring 26 January 2008 as an International Action Day. A day where all of us join efforts to put pressure on the Israeli government to end the siege on Gaza. Therefore, we call upon all of our friends and supporters around the world to organize activities in that same day in their hometowns, to protest the Israeli siege on Gaza. We suggest organizing delegations to meet with parliament members and government officials, media exposure, and organizing demonstrations in front of the Israeli embassies/consulates. In this context, we wish to emphasize on Prime Minister Fayyad’s initiative that the Palestinian National Authority re-gain control over the Palestinian side of the crossings; an initiative that won the support of many relevant parties including the Quartet. It is thus deemed very important that all our calls and activities to end the siege on Gaza be associated with a strong emphasis in support of PM Fayyad’s initiative, which represents a practical, timely, and feasible way to end the siege. Today marks the 59th anniversary of the International Human Rights Day. It is the day the UN declared the issuance of the “International Declarations of Human Rights” to put new international foundations for enforcing and respecting the sacred life and dignity of human beings. It might be a co-incidence for the birth of this declaration with the anniversary of the Palestinian uprooting in 1948, still experienced by Palestinians up until today. This occasion comes as Palestine and the whole region are immersed in continuing incidents of violence, political instability, and violations of human rights. Palestinian people are witnessing tremendous violations to their rights. Israel persisted to use the policies of political assassinations, targeting innocent civilians and objects, confiscating land, uprooting trees, demolishing homes, and preventing citizens from using their natural resources such as land, water, and fishing wealth. Moreover, Israel has continued tightening checkpoints, building the separation wall in the West Bank as well as tightening strict political and economical siege as well as partitioning the whole OPT and restricting freedom of movement. In an unprecedented action, Israel has prevented all Palestinian citizens in Gaza Strip of movement, including patients (except a very few number of critical cases), students, businessmen, and families. This prevention of goods and basic raw materials has led to paralysis in all aspects of life, and almost entire collapse of the Palestinian economy, as well as serious rise in the poverty rate to about 80%, and unemployment rate into more than 70%. Such situation led to dangerous humanitarian and psychological repercussions. Also, in another escalating action and in continuation of Israeli assaults and strangulation, Israel has declared Gaza Strip as enemy entity, disturbed the provision of electricity, water, and fuels to Gaza Strip. This is in addition to imposing more restrictions on the movement of goods and individuals through all crossings, and restrictions on flow of money. Furthermore, the siege that was imposed on the Gaza Strip has created excessive loss and damage in the different aspects of Palestinian life. For the industrial and agricultural sectors, preventing the import of raw materials essential for Gaza agriculture and industry, and the export of final goods, resulted in the shut down of many manufacturing and agricultural businesses with significant losses in both industries. According to the Palestinian Private Sector Coordination Council (PSCC), the current restrictions have led to the suspension of 90% of Gaza’s industrial operations. The restrictions has impacted the health sector directly as there is significant shortages in certain drugs and medical services. Moreover, there are more than 900 critical cases (fighting death) which need immediate intervention and treatment abroad due to lack of medical services available in Gaza; where 32 cases of whom died so far. The educational system in Gaza has also been affected by the siege. With the start of the new school year, there has been a serious lack of books and a shortage of the raw materials needed for printing. According to the United Nations Relief and Works Agency (UNRWA), one third of the students started the school year without the needed text books. The closures also deprived thousands of students from reaching their universities outside the Gaza Strip. All such measures lead to impoverishment of Palestinian people through systematic policies of deprivation of resources including; natural resources and developmental and humanitarian assistance provided to Palestinians by the international community. As a result, the Palestinian environment today is a combination of deprivation, poverty, feelings of anger, frustration, hopelessness, feelings of powerlessness and despair. Such atmosphere leaves serious mental consequences on the Palestinian people. Such feelings will inevitably lead to further anger which will eventually develop into more violence and defiance. Furthermore, the psychological suffering is reflected in the high levels of domestic, tribal, and community violence in general. Additionally, the results of the research studies reveal the correlation between violence and siege with its traumatizing impacts on the negative behavior of children and their thinking in terms of social and political peace. Palestinians children are suffering from feelings of abandonment and neglect as a result of the inability of their parents to fulfill their basic needs, including providing basic needs of food and security. 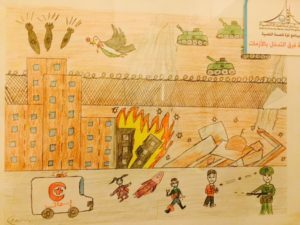 In addition, the feelings of resentment, oppression, defiance, and extremism will leave catastrophic scars on the psychological profile of the next Palestinian generation. As a result, extremism as ideologies will construct the major aspect of the mental schemata for the coming Palestinian generation. This will impact the Palestinian society internally, and will impact the political atmosphere in the whole region, endangering the possibilities of peace and security; which will eventually leave Palestinians with no hope in genuine peace, and gaining their freedom and other legitimate rights. 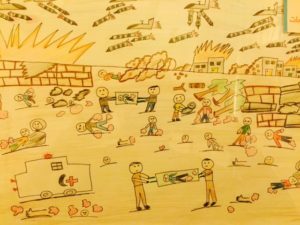 Gaza Community Mental Health Programme warns against the serious impacts of the continuation of these condition that, if does continue, will lead to severe and dangerous deterioration in the mental health among the Palestinian population in the Gaza Strip in particular and in Palestine in general. We, at Gaza Community Mental Health Progrmme, call on the international community and human rights organizations to immediately intervene in order to pressure Israel to stop implementing its plan of strangulating Gaza Strip. Such action, if happen, will aggregate the Palestinian humanitarian sufferings and will lead to more political and security deterioration in the region and the world. On the occasion of the International Human Rights Day, we, call upon the international community, especially the signatories of the 4th Geneva Convention, and human rights organizations to fulfill their responsibilities and urge all countries to respect articles of international law. Significantly, we, urgently appeal to the international community to rescue and protect Palestinians and to break the imposed siege on Palestinian people. We, also, urge them to pressure Israel to prevent its continued violations of Palestinian human rights with all of its forms, and to urgently act on lifting the siege imposed on the Palestinian People. We, the National Committee to Break the Siege of Gaza (hereafter the National Committee), have adopted the initiative of the Gaza Community Mental Health Programme to launch an international campaign for breaking the siege imposed on the Gaza Strip since June 2007. The aim of this humanitarian, non-political campaign is to pressure the Israeli government to lift the devastating siege imposed on the population of Gaza. By raising the awareness of the international community on the deteriorating life conditions resulting from the siege, we aim at other governments to stop the boycott of Gaza. We are pleased to note here that the European Parliament has recently adopted a resolution calling on the Israeli government to end the siege. It is important to declare that this campaign is not affiliated or endorsed by any political party. The National Committee is composed of representatives of the civil society, business community, intellectuals and advocates for human rights and peace from the West Bank and Gaza. We are all guided by our commitment to peace and our respect to human dignity. We believe that it is a moral and ethical duty to rescue the lives of human souls living under bitter circumstances that sabotage their right to exist. People in Gaza are deprived of the simplest requirements for a decent life. We are determined to move hand in hand and shoulder to shoulder with all people who believe in freedom, human dignity and peace. The National Committee needs the support of all people, who believe in humanity all over the world, and in particular Arab people and governments, to contribute to the success of this campaign. We also call upon all Palestinians, whether in Gaza, the West Bank or anywhere else to support our efforts and join our activities. It is a genuine call to rescue people not governments or political parties. It is time to put aside any partisan conflicts and unite people in the pursuit of freedom, justice, and peace. We particularly call upon Jews whose history of trauma, discrimination and suffering should guide them to stand up today against the suffering of others. The Gaza Strip has two main crossings that connect it to the whole world, i.e. Rafah in the south and Erez in the north. There are three other crossings that are used to exchange goods and bring in food to the Gaza Strip. Today all are closed partially or completely. No sooner had Hamas won a majority of seats in the Palestinian Legislative Council elections in 2006, than the Israeli government, with the support of the US administration, clamped down on the Palestinian occupied Territories, declared its boycott of the new Palestinian government, arrested many members of the Legislative Council and refused to transfer customs revenues to the Palestinian government. After taking these measures, several donor countries, including major donor nations in Europe, sharply reduced or terminated the development assistance they offered to the Palestinian people. The result was a swift deterioration of life in the Occupied Palestinian Territory (OPT). The Palestinian people were being subjected to collective punishment because of the way they voted in a democratic election. Following Hamas’ military take-over of Gaza Strip in June 2007, the siege imposed by Israel was tightened to an unprecedented level. Citing the continuing rocket attacks from inside Gaza, the Israeli government has recently declared Gaza to be a hostile entity and has threatened to cut off its electrical power, its fuel supply and to substantially decrease the number of people allowed to enter and leave the Gaza Strip. It has also severely restricted the entry of goods and food supplies, and money needed for the daily life of people of Gaza. The siege that was imposed on the Gaza Strip has created excessive loss and damage in all spheres of Palestinian life. The Gaza Strip has been turned into a huge prison with no access to the outside world. The health sector has been dramatically affected by the siege. According to the latest Humanitarian Situation Report of the Office for the Coordination of Humanitarian Affairs (OCHA) released on October 9th, 2007, fewer than five patients crossed into Israel/West Bank each day for medical treatment compared to an average of 40 patients per day in July 2007. The World Health Organization has indicated that an average of 1000 patients used to leave Gaza for treatment each month prior to the mid-June closures. As a result of the continuous closures, the United Nations World Food Programme (WFP) has reported significant increases in the costs of some food items. The price of 1 KG of fresh meat has increased form NIS 32 to NIS 40 (20%) while the price of chicken rose from NIS 8 to NIS 12 (33%). According to OCHA’s report of October 9th, during the month of September 2007, a total of 1508 truckloads of goods crossed into Gaza. This compares to 2468 truckloads in the month of August and 3190 in July. There are no food stocks left in Gaza, which contributes to the rise in prices. The educational system in Gaza has also been affected by the siege. With the start of the new school year, there has been a serious lack of books and a shortage of the raw materials needed for printing. According to the United Nations Relief and Works Agency (UNRWA), one third of the students started the school year without the needed text books. The closures also deprived thousands of students from reaching their universities outside the Gaza Strip. The Palestinian Civil Affairs Department has declared that more than 5000 people, half of which are students, have applied to leave Gaza via Israel and have not yet been able to leave. On the industrial level, Israel’s refusal to allow essential raw materials to be imported, and finished goods to be exported, has led to the closure of many manufacturing industries and other businesses. According to Paltrade’s assessment on 12 September 2007, over 75,000 private sector employees have been laid off in the last three months. The agricultural sector is also at risk. According to ACHA’s report, the export season for Gaza’s cash crops (strawberries, carnation flowers and cherry tomatoes) is expected to begin in mid-November. This year, 2,500 dunums of strawberries have been planted with an expected production of approximately 6,250 tons of strawberries including 2,500 destined for European markets. Some 490 tons of cherry tomatoes are also expected to be produced. If exports are not allowed by this time, farmers will be exposed to tremendous losses in terms of production cost and potential sales. The WFP reported that poverty now affects 80 percent of the Gaza population. Since human beings are the products of the environment in which they live, the Palestinian environment today is a combination of deprivation, poverty, anger, feelings of powerlessness and despair. Such feelings will inevitably lead to simmering anger which will eventually brew into more violence and defiance. Palestinians have gone through repeated traumas of destruction of their homes, lives, livelihoods and hopes for the future over the past few decades. The current siege adds a new trauma to previous ones people have experienced, bringing to the surface a host of negative feelings. It is only to be expected that in such an environment extremist ideologies will flourish. This will have an adverse impact on Palestinian society internally and the political environment in the whole region, undermining any possibility of building peace and security. Putting all in a nutshell, with this immoral siege, the Gaza Strip is meant to be choked into final submission. It is being transformed into an island of death where everything is destroyed. It is our duty to rescue life. The campaign is planned to take place from December 2007-May 2008. It is proposed that the National Committee will start the campaign with a press conference, announcing the launching of the campaign and asking friends at the local and international level for their contributions and participation in the activities of the campaign. An international petition to break the siege on Gaza will be disseminated worldwide. The campaign will include a variety of activities including inviting international visitors from around the world for a series of individual or group visits to Gaza. The visitors will be hosted in Palestinian homes. They will gain first hand information about the living conditions and hardships faced by the Palestinian people in order to disseminate it in their own countries. The activities in Gaza will be well documented and media coverage encouraged. We will rely on our Israeli friends to host and help our friends from abroad who, if they are not allowed to enter Gaza, will help expose Israeli policies and siege conditions through the media and public speaking in their home countries. We will arrange for a peaceful march to Erez checkpoint from both the Israeli and Palestinian sides of the borders. It will include peace activists from all over the world. As part of the campaign, solidarity meetings, cultural activities, and discussion with various layers of Palestinian society will take place. Internationally, we seek to mobilize people for the campaign in all parts of the world, particularly in the US, Europe and Israel using printed and media materials documenting the effects of the siege. The campaign will be concluded in May by a major event, which is the arrival of 120 human rights activists including Noble Prize winners to Gaza via the sea from Cyprus. This event will be titled ‘Free Gaza Movement Day’ and is planned by a solidarity group in USA. The campaign will have special posters as well as a website where all relevant materials will be published. The site will give special opportunities for people to exchange information, ask questions, and comment on the planned activities. Throughout the campaign, close contact with the media will be maintained with the regular feeding of information, news and visuals. The international community celebrates today the annual occasion of World Mental Health Day which is considered a day for raising awareness and knowledge of this significant aspect of life. The mental health has high importance in people’s enjoyment of physical health, happiness, playing social and humanitarian role properly in family, community, and world. This occasion comes while the Palestinian people, especially in Gaza Strip, are living under severe political and economic conditions. The Israeli occupation practices escalate day by day. They include: killing, demolishing homes, razing agricultural lands, tightening checkpoints as well as imposing total siege and closure on the movement of people and goods to and from Gaza Strip. In an unprecedented action, Israel has deprived all Palestinian citizens in Gaza Strip of movement, including patients (except a very few number of critical cases), students, businessmen, and families. Israel has thereby transformed almost 1.5 million civilians into prisoners until further notice. The prevention of the movement of goods and basic raw materials has led to paralysis in all aspects of life, and the near collapse of the Palestinian economy, as well as a serious rise in the poverty rate to 87%, and unemployment rate to 70%. Also, in another example of escalating repression, Israel has declared the Gaza Strip to be an ‘enemy entity,’ and has threatened to cut off the provision of electricity, water, and fuels to Gaza Strip. The Gaza Community Mental Health Programme considers this decision illegal and immoral and believes it is in contradiction with principles of international law and human rights as well as with Israel’s responsibilities as an occupying state. GCMHP also views this declaration as a dangerous intensification of the policy of strangulation it has inflicted on Palestinian civilians and as a form of collective punishment that will harm and increase the suffering of more than 1.5 million civilians — children, women, elderly, and unemployed workers. Such practices have serious mental consequences for the Palestinian people, a majority of whose civilians are suffering from feelings of anger, anxiety, panic, depression, frustration, and hopelessness as a result of Israeli occupation practices, siege, and poverty. GCMHP warns that these conditions will lead to a severe and dangerous deterioration in the mental health among the Palestinian population in the Gaza Strip in particular and in Palestine in general. We, at Gaza Community Mental Health Programme, call on the international community and human rights organizations to immediately intervene in order to pressure Israel to stop implementing its plan of strangling the Gaza Strip. Such an action will aggregate the Palestinian humanitarian sufferings and will lead to an even greater political and security deterioration in the region and the world. Finally, GCMHP would like to extend its greetings to colleagues who work in the field of mental health, both in Palestine and worldwide, for their efforts and roles in improving and developing the mental health for human beings everywhere. Further, on this occasion, GCMHP calls on them to exert their utmost efforts to support the rights of the Palestinian people in order to enjoy human dignity, and to end all forms of violence that target the Palestinian people, the first of which is ending the Israeli occupation of the Palestinian land, as well as granting the Palestinians their rights to self-determination. This will contribute to the enhancement of the mental health of the Palestinian people and will bear fruitful results with regard to peace and development in the region and the entire world.